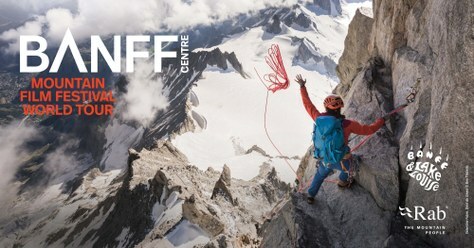 The world-renowned Banff Centre's Banff Mountain Film Festival celebrates its 42nd year, continuing to bring the best action, environment, and adventure films to audiences in Banff and no less than 40 countries across the globe. As a benefit of membership, our members get early access to tickets and discounts on many of our events. Join using promo code ME18BANFF at checkout to save 20% off membership and save on ticket prices. The Tacoma premiere will be at The Rialto Theater in downtown Tacoma. The line-up of movies is different each night, so go one night or both! Discounted ticket sales open to Mountaineers members on Oct 10. To redeem your benefits, click here to find the Banff promo code. Apply the code when purchasing your tickets. Ticket sales open to general public on Oct 17. Tickets can be purchased in person at the Edgeworks Climbing Gym or online through the Broadway Center. The Seattle premiere will be at Benaroya Hall in downtown Seattle, in the S. Mark Taper Auditorium on December 5 and 6 at 7pm. The line-up of movies is different each night, so go one night or both! *Ticket prices do not include the Benaroya Hall $3 +12% processing fee per ticket. Discounted ticket sales open to Mountaineers members on Oct 9 at 10am. To redeem your benefits, click here to find the Banff promo code. Apply the code when purchasing your tickets. Ticket sales open to general public on Oct 11 at 10am. Tickets can be purchased on the Benaroya Hall ticketing page. For questions regarding our Seattle tickets, please contact our Member Services Team. The Olympia premiere will be at Capitol Theater. Tickets now on sale! The line-up of movies is different each night, so go one night or both! *To receive two night discount, add December 8 and 9 to your checkout cart and the discount will be applied. 360-754-6670 or 360-870-4856 or email Mike Riley.